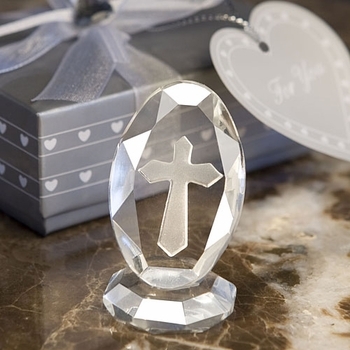 Your guests will love to display these gorgeous Crystal Cross favors as a testament to their faith and as a sentimental remembrance of your special day! Perfect for Christenings, First Communions, Baptisms and more, these captivating crystal cross statues are always well received. Standing 2 inches tall and an inch wide, each features a timeless cross design artfully engraved into the multifaceted glass crystal body and base. Presented in a silver gift box each is laid in a white satin staging and finished with a white satin bow with a heart shaped rhinestone in the center. On the box is affixed a matching tag that reads �For You� on it.